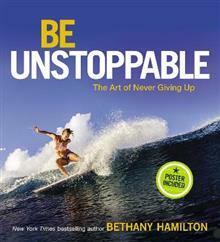 In Be Unstoppable, New York Times bestselling author and champion surfer Bethany Hamilton shares insights alongside over sixty breathtaking photos from her documentary, Bethany Hamilton: Unstoppable. As she surfs dangerous waves around the world, Bethany inspires readers to boldl... read full description below. In Be Unstoppable, New York Times bestselling author and champion surfer Bethany Hamilton shares how faith, love, and passion have pushed her beyond all expectations. Alongside over sixty breathtaking photos from the making of her new documentary, Bethany Hamilton: Unstoppable, Bethany inspires readers to be bold, enjoy life, and be the best they can be. No one knows what will happen along life's journey, but Bethany's sense of wonder and adventure found through hard work and devotion shines through all her pursuits.Known most notably for one of the biggest comeback stories of our era, Bethany Hamilton has since become synonymous with being unstoppable. Bethany is a sought-after public speaker, professional surfer, and spiritual icon. She is empowering audiences worldwide to live their lives with more tenacity, courage, and faith. In this four-color, giftable photo book with a decorated cover, inspiration is found on every page. Bethany Hamilton is a source of inspiration to millions. In 2003, while surfing, she lost her left arm to a 14-foot tiger shark. With resilience and tenacity, Bethany returned to the water a month later, and within two years won her first national title. Her unbelievably positive attitude fascinated the world, resulting in an autobiography that was later adapted into the film Soul Surfer. Her courage and talent led to her induction into the Surfer's Hall of Fame in 2017. Bethany and her husband, Adam Dirks, are also involved in charities such as Friends of Bethany, a foundation she and her family created to support amputees and youth. In addition, Bethany authored Body and Soul to encourage others toward confidence and fitness. Her new documentary Bethany Hamilton: Unstoppable brings her passions together, showcasing her world-class surfing and love for life as well as her message of female empowerment and never giving up.